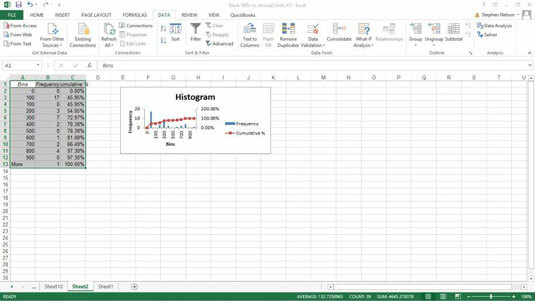 In Excel, you can use the Histogram Data Analysis tool to create a frequency distribution and, optionally, a histogram chart. A frequency distribution shows just how values in a data set are distributed across categories. A histogram shows the same information in a cute little column chart. Here’s an example of how all this works — everything will become clearer if you’re currently confused. To use the Histogram tool, you first need to identify the bins (categories) that you want to use to create a frequency distribution. The histogram plots out how many times your data falls into each of these categories. This worksheet shows bins information in the worksheet range E1:E12. The bins information shows Excel exactly what bins (categories) you want to use to categorize the unit sales data. The bins information shown in the worksheet range E1:E12, for example, create hundred-unit bins: 0-100, 101-200, 201-300, and so on. Click the Data tab’s Data Analysis command button to tell Excel that you want to create a frequency distribution and a histogram. When Excel displays the Data Analysis dialog box, select Histogram from the Analysis Tools list and click OK. In the Histogram dialog box that appears, identify the data that you want to analyze. Use the Input Range text box to identify the data that you want to use to create a frequency distribution and histogram. If you want to create a frequency distribution and histogram of unit sales data, for example, enter the worksheet range $B$1:$B$38 into the Input Range text box. To identify the bins that you use for the frequency distribution and histogram, enter the worksheet range that holds the bins into the Bin Range text box. In the case of the example worksheet, the bin range is $E$1:$E$12. If your data ranges include labels, select the Labels check box. Tell Excel where to place the frequency distribution and histogram. Use the Output Options buttons to tell Excel where it should place the frequency distribution and histogram. To place the histogram in the current worksheet, for example, select the Output Range radio button and then enter the range address into its corresponding Output Range text box. To place the frequency distribution and histogram in a new worksheet, select the New Worksheet Ply radio button. Then, optionally, enter a name for the worksheet into the New Worksheet Ply text box. To place the frequency distribution and histogram information in a new workbook, select the New Workbook radio button. 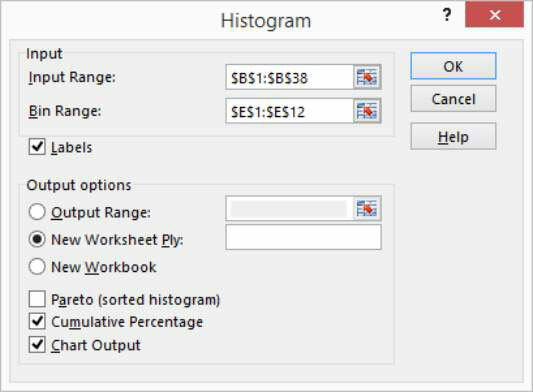 Make choices from the Output Options check boxes to control what sort of histogram Excel creates. For example, select the Pareto (Sorted Histogram) check box, and Excel sorts bins in descending order. Conversely, if you don’t want bins sorted in descending order, leave the Pareto (Sorted Histogram) check box clear. Selecting the Cumulative Percentage check box tells Excel to plot a line showing cumulative percentages in your histogram. Optionally, select the Chart Output check box to have Excel include a histogram chart with the frequency distribution. If you don’t select this check box, you don’t get the histogram — only the frequency distribution. Excel creates the frequency distribution and, optionally, the histogram. Here is the frequency distribution along with a histogram for the example workbook data. 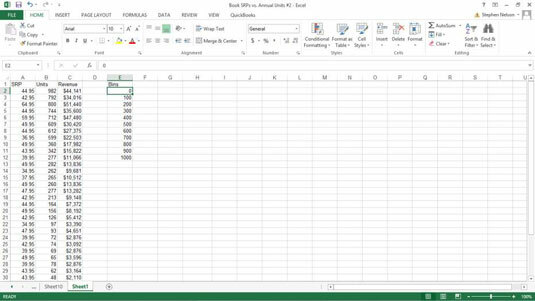 Note: Excel also provides a Frequency function with which you use can use arrays to create a frequency distribution.